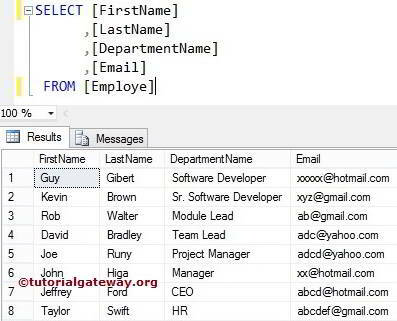 The SQL CONCAT one of the String Function, which is used to combine two or more strings and returns string. TIP: Unlike + Operator CONCAT Function will convert Null values into Empty string while displaying the result. As you can see from the above syntax, this function accepts N number of string values. The SQL String CONCAT Function simply returns the string by combining two or more strings. The following query will show multiple ways to use Concat function. Below lines of code is used to declare two string variables and assigning them some data. Below statement, Concat function will combine the two variable and produce the string result. We also assigned new name to that result using SQL ALIAS Column. The CONCAT function also allows you to combine multiple columns. In this example,We are going combine the First name and Last Name columns present in the Employe column to get Full name. 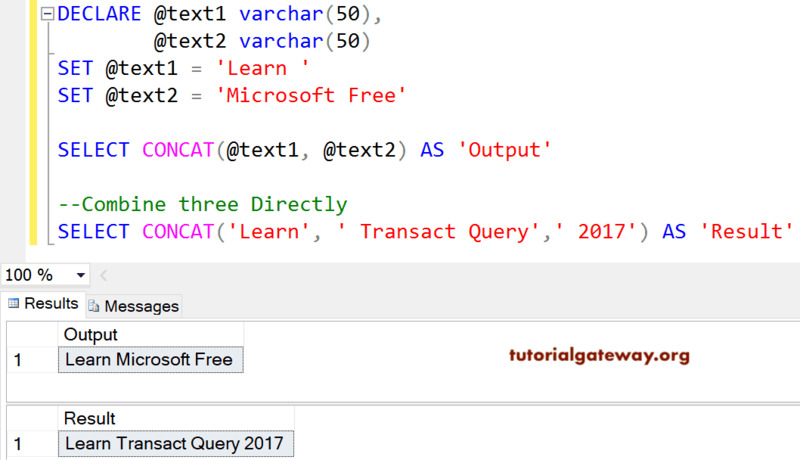 The CONCAT function in Sql Server also allows you to combine columns and string text in one statement. In this example,We are going combine the First name, Last Name and Department name columns present in the Employe column and string text = ‘is working as’.